We believe in putting the Patient Focus in everything we do. We are dedicated to providing the tools, resources, and knowledge to empower and strengthen patients to manage their conditions. It is our firm belief that, when battling a rare disease, it’s all about the company you keep. At Catalyst, considering the patient perspective is the central component in our decision-making process. When patients take an active role in their healthcare, make informed decisions, and participate in research, not only may they improve their own health but also the health and lives of others. 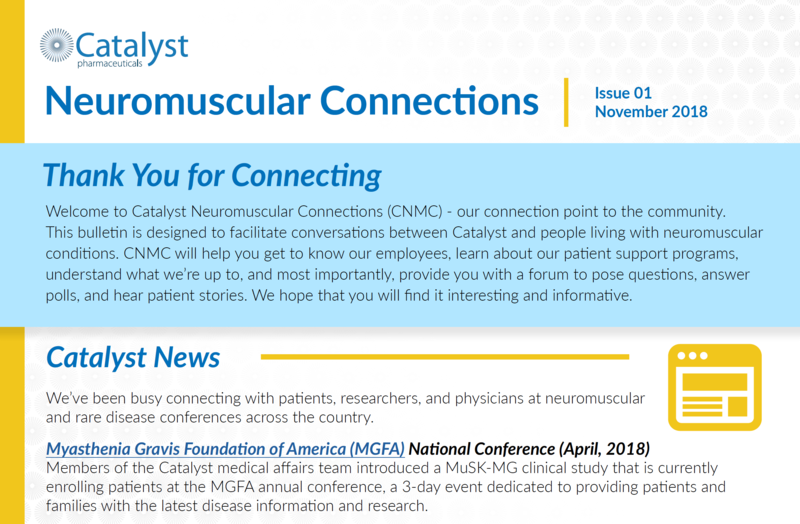 We created Catalyst Neuromuscular Connections (CNMC), our periodic community newsletter, to keep you informed and facilitate conversations between Catalyst and people living with neuromuscular conditions. Stay connected and download our latest issue! View stories of hope and perseverance. A simple resource to help you better understand a diagnosis. Access to events and advocacy groups for rare diseases.